Potatoes are an inexpensive, nutrient-rich and abundant food that can be cooked in many different ways. One of my favorite ways to eat them is by steaming because they retain most of their nutrients and are quickly ready to eat. Are you looking for some healthy side dish options that cook up quickly and do not require very many ingredients? Have you been looking to trim your grocery budget and focus more on whole foods? I wondered how to steam potatoes without having a lot of equipment or time to do so because meal times are busy at my house. I did some research on the easiest and fastest ways to make steamed potatoes. Read what I found so that you can enjoy steamed potatoes as a healthy and filling side dish for your next lunch or dinner. To steam potatoes, you will need a 4-quart pot made of cast iron, stainless steel, enamel, ceramic or the material of your choice. The pot must come with a lid to hold in the steam. 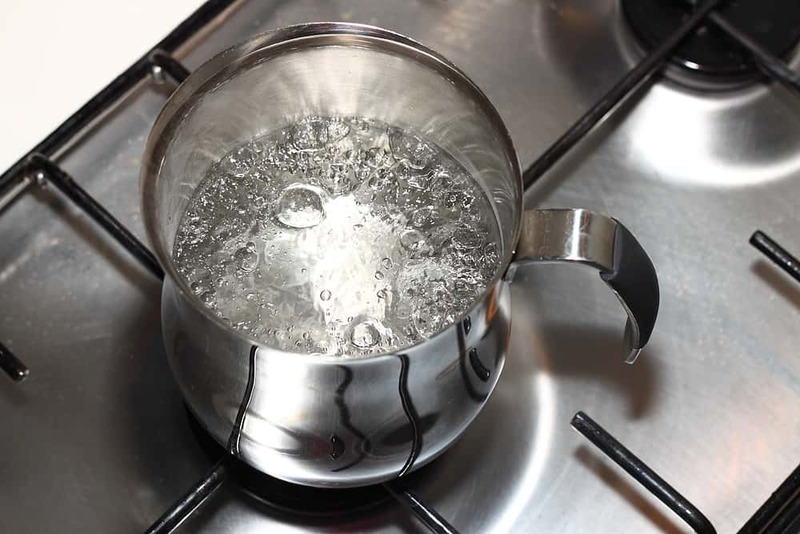 A non-stick coating is not necessary because you will only be using the pot to boil water. You will need to fill the pot with about 2 quarts of water. If your pot does not have a cover on its handle, wear an oven mitt so that you do not burn your hands as the pot heats. A steamer insert can be made out of porcelain, stainless steel, aluminum or plastic. It is made to fit over the top of the pot. 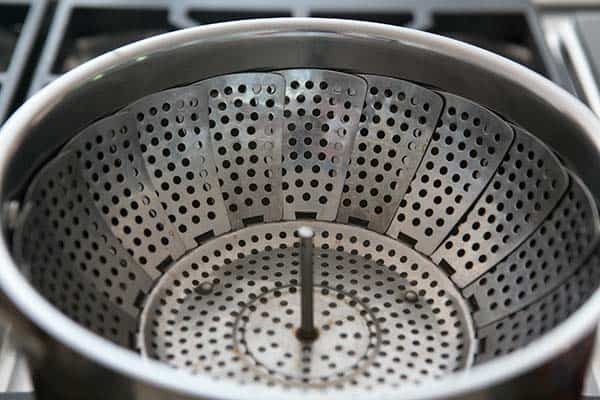 It has slits, perforations or holes that allow steam to reach the food in the insert's basket. The insert has lips that hang over the edge of the pot in order to keep it in position throughout the cooking process. The insert's diameter should be compatible with the size of the pot that you are using to boil the water. You will need to have a fork on hand so that you can use it to test how well done the potatoes are during the steaming process. 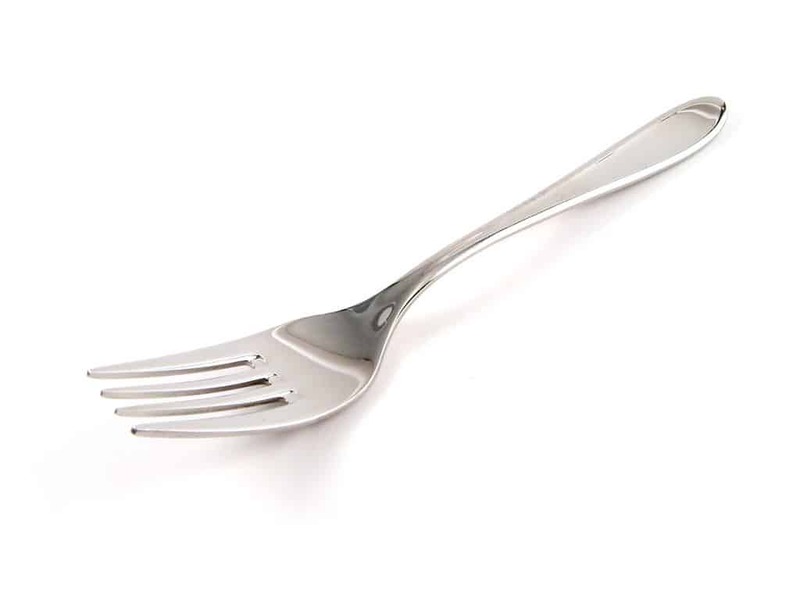 You should choose a fork that is made out of metal as a plastic fork may warp, bend or break if you try to use it over steam. The fork should be a typical dinner fork with long enough tines that can pass all the way through to the center of the potatoes you are steaming. It does not matter what kind of potatoes you cook with the steaming method. All types of potatoes can be steamed with equally good results. It is up to you if you desire to peel the potatoes before steaming them, and you may not need to cut the potatoes if they are smaller in size, such as Red potatoes or Fingerling potatoes. Larger types such as Russet will need to be cut into smaller pieces before steaming so that the pieces cook evenly in a timely manner. To clean the potatoes, run them under tap water to remove dirt and any pesticides left on the vegetable. You can use a vegetable brush if there is dirt stuck onto the surface of the potatoes. It is not necessary to use any special rinses or any other products to clean the potatoes. If the potatoes are larger than 2 inches in diameter, you will need to cut them so that they are no bigger than 1 inch in thickness. For smaller potatoes, you could cut them in half or in quarters. 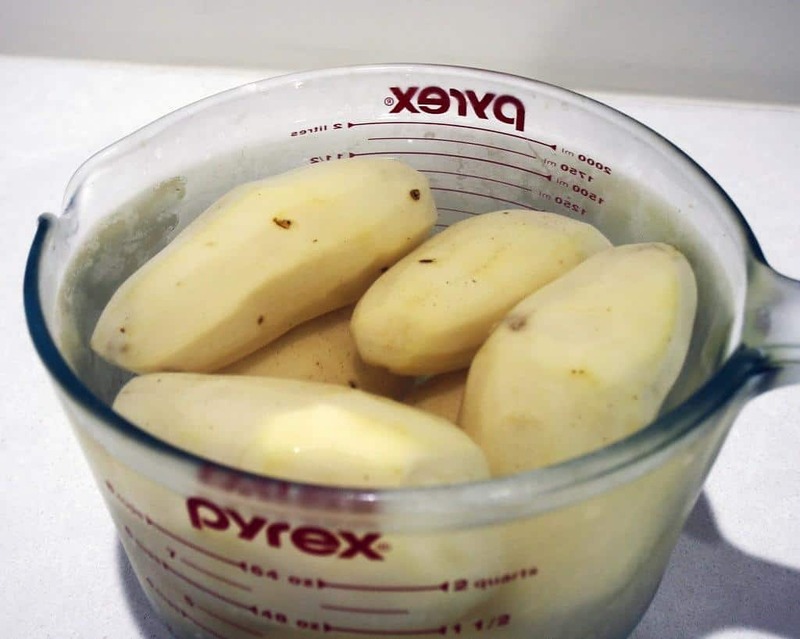 For larger potatoes, you may need to cut them into many cubes. Use a knife of your choice, a utility knife, for cutting the potatoes. While cutting, remove any brown spots or eyes. It is not necessary to remove the peel from the potatoes, but you can if you want to. If you choose to peel the potatoes and you do not want to spend a long time doing so, you could consider using this technique. It is a little messy, but it only takes about one minute. You can add the peels to your compost bin. Fill your large pot about halfway with tap water. For a 4-quart pot, this is about 8 cups of water. It is not necessary to measure the amount of water precisely because you are only heating the water in order to generate the steam that will cook the potatoes. You do not have to use bottled or distilled water because the water will not actually touch the potatoes. Turn on the burner that can accommodate the size of your pot and turn the heat up to medium high. Place the pot onto the burner and wait for the water to boil. The water should achieve a rolling boil that generates steam. If you prefer, you can turn on the exhaust fan above your stove top so that your kitchen does not get too steamy. Place the potatoes in a single layer in your steamer insert. It is okay to have the pieces of potatoes touching each other. There should only be one layer of potatoes so that the steam can reach all of the pieces evenly. 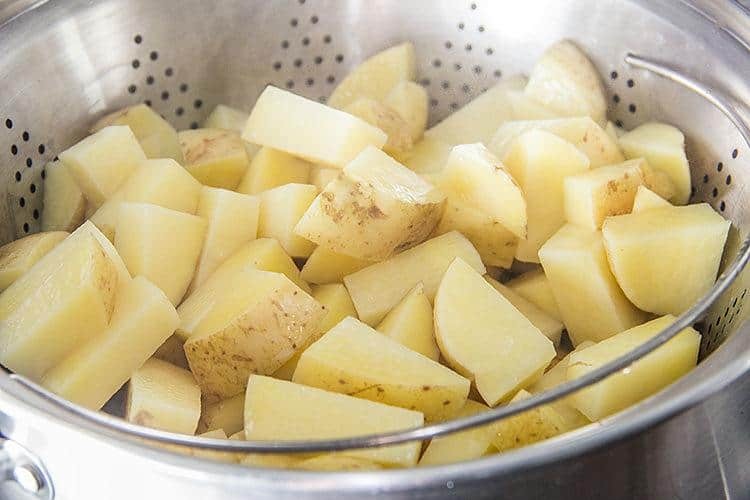 If you need to cook many potatoes, you may need to separate them into batches so that there is just a single layer of potatoes in the steamer insert for each batch. Place the insert onto the pot of boiling water and put the pot's lid on top of the steamer insert. This keeps the steam inside so that the potatoes can cook. If you are steaming cubed potatoes that are about 1 inch in size, the steaming process will take about 15 minutes. 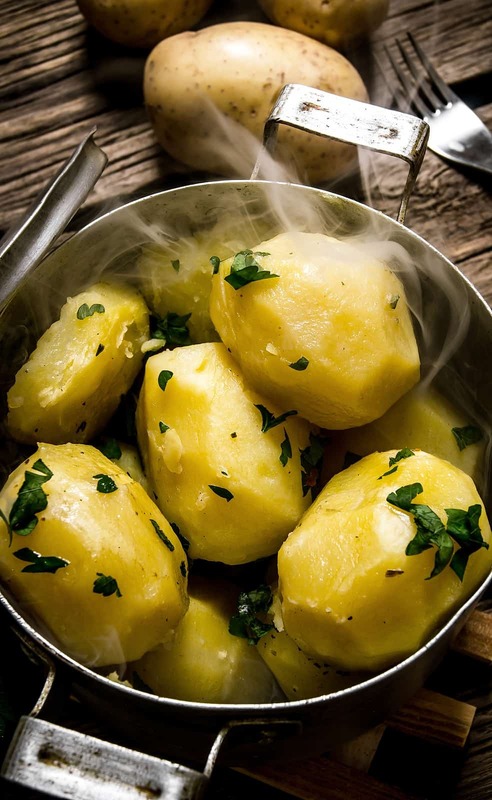 If you are steaming potatoes that have been sliced into halves or quarters, the steaming process will take about 20 to 25 minutes. Avoid taking the lid off the steamer during the steaming process because this will extend the cooking time. To see if the potatoes are done cooking, lift the lid off the steamer insert. Use your fork and push it through one of the pieces of potato. 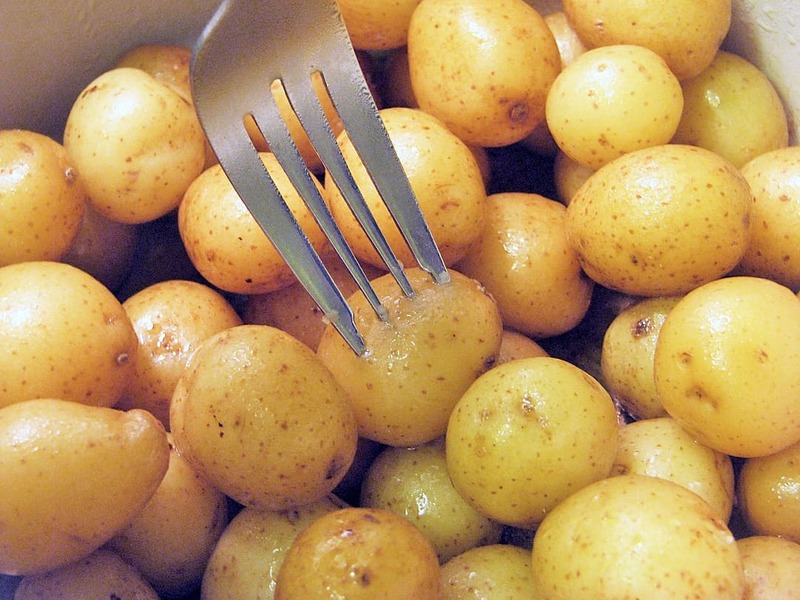 The tines of the fork should easily slide all the way through the center of the potato. If you feel resistance or the fork gets stuck, this means that the potatoes are not yet fully cooked and need a few more minutes of steaming time. If you plan to mash the potatoes, you may want to cook them longer for a softer consistency. If you plan to make a cold dish such as potato salad, cook them just enough to be fully done but still firm. Once the potatoes are fully cooked, turn off the burner. Remove the lid from the pot and lift up the steamer insert with two hands. You may need to wear oven mitts to protect your hands from the heat. I like t﻿﻿his pair because the steam does not penetrate through the silicone, and the separate fingers provide plenty of dexterity for picking things up. You can now eat the potatoes or mash them. 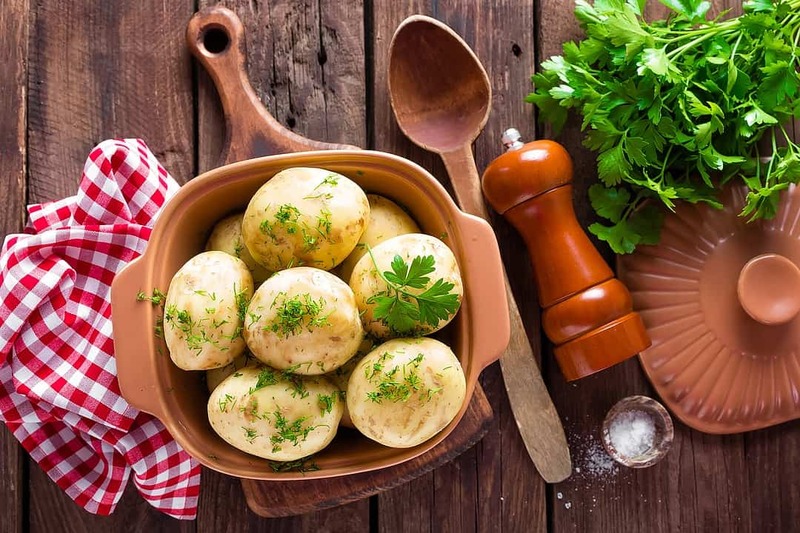 If you are using the steamed potatoes as an ingredient in a cold side dish such as potato salad, put the potatoes into a container and refrigerate them before adding them to the side dish. In order to properly peel potatoes, Martha Stewart suggests that you use a paring knife. A paring knife is a small knife that has a short and sturdy blade designed for use on vegetables. The small blade is easy to control so that you can hold the potato in one hand and use the other hand to make long, consistent strokes with the blade. The paring knife can also remove any eye spots that are on the surface of the potato. The tip of the knife is sharp enough to dig out the eye's root. When choosing potatoes to steam, Chef Rick suggests selecting potatoes that are small in size. The potatoes should be free of blemishes. If possible, choose potatoes that are uniform in shape or at least do not have any strangely shaped projections or lumps that would be difficult to peel. If you can, choose potatoes that do not yet have any eyes growing on them. Potatoes with eyes have probably been sitting around in a storage area for a long time and will not be as fresh as potatoes without eyes. 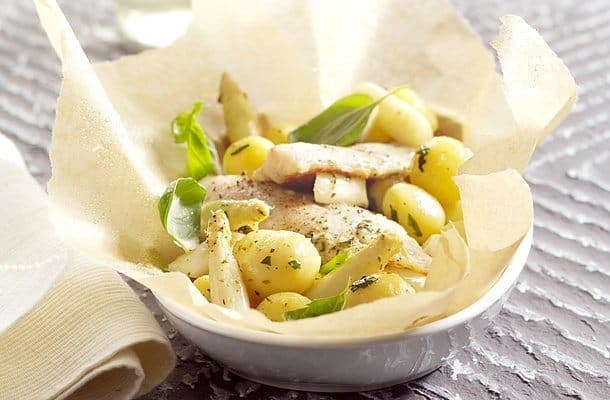 If you want the skin to stay on your potatoes throughout the cooking process, Chef Gordon Ramsay suggests that you soak them first in cold water. The skin is the most nutritious part of the potato and includes many vitamins and fiber. By keeping the peel attached to the potato throughout the cooking process, it will also be easier to serve the steamed potatoes. When the skin stays on, the potatoes will look more attractive in your side dish. You will also not have to worry about loose skins clogging up the perforations in your steamer while cooking. Did you enjoy this tutorial on how to steam potatoes? I like to make steamed potatoes so that I can have an easy lunch or dinner on a busy day. This way of cooking potatoes is simple, fast and healthy, and you can use your favorite type of potato. If you do not yet have a steamer insert for your 4-quart cooking pot, remember that this is a great option and can be used to steam other vegetables as well. Having a pair of these silicone oven mitts on hand will help to protect your hands. Have any other tips? Post your comments below and share this post if you liked it! If you'd like to know how to store potatoes, you can read more at How long are potatoes good for.